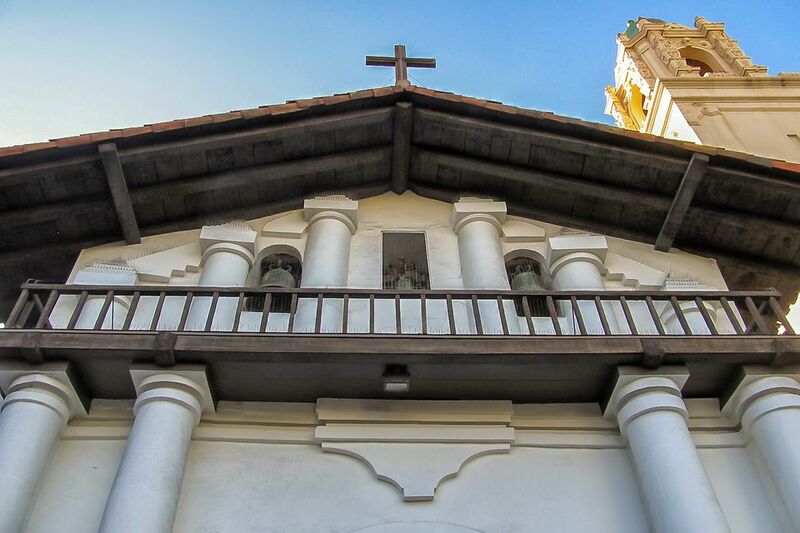 Mission Dolores was founded June 26, 1776, by Father Francisco Palou. The official name, Mission San Francisco de Asis, honors Saint Francis of Assisi. Mission San Francisco de Asis is also known as Mission Dolores. It is the oldest intact, original mission building in California. Mission San Francisco de Asis is located at the intersection of 16th and Dolores Streets. You can get its hours, address and transportation info on Mission Dolores website. On June 17, 1776, Lieutenant Jose Moraga, 16 soldiers and a small group of colonists left the Monterey Presidio for San Francisco Bay. The party included wives and children of the soldiers, along with some Spanish-American settlers. They took about 200 head of cattle with them. Most of their supplies were sent by sea in the ship San Carlos, which left at the same time as the land party. Among the travelers were Fathers Francisco Palou and Pedro Cambon. It took them four days to travel about 120 miles. When they arrived in what is now San Francisco, they set up a camp on the bank of a lake. Earlier, explorer Juan Bautista de Anza named the lakeLaguna de Nuestra Senora de los Dolores (Lake of Our Lady of Sorrows) which is where the mission got the nickname Mission Dolores. Moraga ordered an arbor to be constructed. The Fathers celebrated the first mass on the feast of Saints Peter and Paul there on June 27, 1776 - just five days before the Declaration of Independence was signed in Philadelphia. Some people say the mission was founded that day, but the official dedication happened later. On August 18, the ship San Carlos arrived. Construction of Mission Dolores began immediately, but they had to wait to dedicate the church. The Fathers were waiting to hear from Captain Rivera who didn't want to build Mission Dolores. His superior the Viceroy in Mexico City disagreed and but the Fathers waited for weeks until they got the needed church documents. The mission was dedicated on October 9. Some people say this date is the official date of the founding, and it is the date that Father Palao recorded in the church records. The Mexican authorities had promised Father Junipero Serra that he could name the newest in the chain after his patron saint Saint Francisco of Assisi if they found a port. This location had one, so it was named Mission San Francisco de Asis. Mission Dolores soon became popular with the natives of the area, who enjoyed the food and protection it offered. Some people say they did not understand the Spaniards' complex religious ideas, while others say the priests were too harsh and strict with them. Whatever the reason, many of them ran away from Mission Dolores (200 in 1796 alone). The problem with runaways was worse in San Francisco than in other places, where the natives had many temptations from the nearby Presidio and other natives across the bay. Runaways also caused tensions with the military, who got tired of going out to retrieve them. The Mission Dolores church was moved several times before the current chapel was built and completed in 1791. The damp weather and diseases carried by the foreigners took their toll on the native neophytes, and 5,000 of them died during a measles epidemic. The people who survived suffered in the damp climate. In 1817, the Fathers opened a hospital in San Rafael, north of the bay, where the weather was better. In the 1830s, the place began to be called Mission Dolores, after the nearby creek and lagoon, and also so it wasn't confused with Mission San Francisco Solano which is in the town of Sonoma. In 1834, the Mexican government decided to close all of the California missions and sell the land. Mission Dolores was the first to be secularized. The Indians did not want to come back, and no one would buy it, so it remained the property of the Mexican government. In 1846, California became part of the United States, and American priests took over. When the California Gold Rush began in 1849, the area became a popular place for horse racing, gambling, and drinking. Land reforms took the land away from the natives, and soon there were more Irish than Spanish grave markers in the old cemetery. The old Mission Dolores building is surrounded by the city today. The church and its cemetery are all that survive of the original complex, but it continues to serve the people of the neighborhood and masses are sometimes held in it. However, most services are held in the newer basilica next door. The first building at Mission San Francisco was a tule (reed) arbor built by the Spanish soldiers. When the ship San Carlos arrived with supplies in August, construction on more permanent buildings began The first buildings were completed by September 1, including a small chapel made of wood plastered with mud, with a tule reed roof. These buildings were about one-tenth of a mile from the present location. From 1776 to 1788, four churches were built. Each one was torn down because it stood on good soil for farming, and good farmland was scarce. By 1781, the mission settled at its current location, and a wing of the quadrangle was finished. The current building at Mission San Francisco was started in 1785 and completed in 1791. The flexible structure, with redwood logs fastened together by rawhide strips and wooden pegs, was so sturdy that it survived the earthquakes of 1906 and 1989. The building is 114 feet long and 22 feet wide, with 4-foot-thick adobe walls. Historical records say it took 36,000 adobe bricks to build it. Inside the chapel, the current tile floor was originally dirt, and there were no seats, but otherwise little has changed since 1791. The decoration on the ceiling is repainted in the original design. The walls were originally painted with designs, too, but they were painted over in the 1950s. On the right wall is a large nineteenth-century canvas painting that was once moved to the front of the church every year during Easter week. reredos came from San Blas, Mexico in 1796. The two side altars, also made in Mexico, were brought to the mission in 1810. The mission's three bells were cast in Mexico in the 1790s and honor saints Joseph, Francis, and Martin. The fonts set into the back walls are plates imported from China by way of the Philippines. There are four marked burial places inside the chapel walls: William Leidesdorff, an early Afro-American businessman; the Noe Family; Lieutenant Joaquin Moraga, the leader of the founding expedition, and Richard Carroll, the first pastor after San Francisco became an archdiocese. After the mission survived the 1906 earthquake, steel was added to the wooden trusses to strengthen them. The historic structure faced its biggest challenge in the late 1990s when wood-eating beetles threatened to destroy it bite by bite. However, through extensive efforts by the mission staff and scientists, the beetles were killed, and the mission was saved. Today, Mission San Francisco is the oldest intact building in the city of San Francisco. The brightly-colored and highly patterned ceiling of the mission's interior are only part of its charm. The ceiling's chevron patterns are similar to those in baskets woven by local native women. The ornate sculpture behind the altar came to San Francisco from San Blas, Mexico in the late1800s. It is called a reredos. The picture above shows the mission's cattle brand. It was drawn from samples on display at Mission San Francisco Solano and Mission San Antonio.